January has been designated "Thyroid awareness month". Find out about the function of this gland and learn to recognize the symptoms when something is wrong with it. I must confess that the first time I heard someone say that they were suffering from the thyroid, I figured "duhthiroy" was the name of a strange disease that I would not encounter often. It was not until much later that I understood the importance of the thyroid gland, whose role is vital to maintaining the balance in our bodies and therefore a sense of well-being. Thyroid diseases are even more common than diabetes, and yet, not much is heard about them. It is estimated that over 30 million Americans have thyroid problems, and that up to half of these have not yet been diagnosed. No specific studies have been conducted in Puerto Rico, but if the trend were to remain constant, that would mean that more than 200,000 cases of thyroid disease remain undiagnosed in our island. 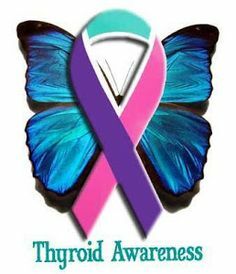 This is why January has been named "Thyroid Awareness Month": an entire month destined to raising awareness about the thyroid gland. The thyroid is a gland shaped like a butterfly that is located in the front of the neck below the "laryngeal prominence" or "Adam's apple". As part of the endocrine system, its function is to produce T3 (triiodothyronine) and T4 (thyroxine), who commonly are called thyroid hormones. Through these hormones, thyroid communicates with important organs, affecting our breathing, heart rate, weight, energy level, and even our mood. So in short, if it does not work well, neither do we. To illustrate how this works, I'll borrow a comparison used in The Harvard Medical School Guide to Overcoming Thyroid Problems, and suggest that the thyroid is similar to a car engine. In this case, thyroid hormones are like the energy produced by an engine; producing a greater amount of hormone means that the body's systems will work at a “faster” rate and vice versa. Now, it is clear that an engine needs fuel to be able to work. The thyroid’s fuel is iodine. Iodine is often added to table salt, and is also present in milk, bread, and seafood. We usually exercise control over our cars by pressing or releasing the gas pedal. If the indicators for speed on our dashboards have surpassed the maximum speed limit, then we let go of the gas pedal, in order to slow down. If we have yet to reach the speed limit, then we usually press down further. This same type of control is exercised by the body on the thyroid through a network known as the HPT axis, the hypothalamus-pituitary-thyroid axis. To better map out the scene, we can say that the hypothalamus is a section of the brain, whereas the pituitary is an endocrine gland at the base of the brain. The hypothalamus releases TRH, thyroid regulatory hormone. The TRH acts on the pituitary to produce TSH, thyroid stimulating hormone. This will push the thyroid to produce more T3 and T4, the hormones circulating in our body that affect metabolic processes within all types of cells. When levels of T4 and T3 in the blood have reached a certain level, this causes a reduction in the amount of TRH and TSH released. In consequence, it also decreases the production of thyroid hormones. This control allows us to maintain optimum hormone levels. But, what happens when your thyroid “gets sick”? Thyroid problems can be divided into structural and functional disorders. Structural disorders include goiter (enlarged thyroid), benign nodules, and tumors. Functional disorders include hyperthyroidism (when too much hormone is produced) and hypothyroidism (when not enough hormone is produced). These functional disorders can be caused by defects in the HPT axis or by autoimmune diseases, where the immune system attacks a person's own cells, in this case the cells of the thyroid gland. Symptoms of hyperthyroidism are fatigue, nervousness or irritability, insomnia, muscle weakness, heat intolerance and excessive sweating, rapid and irregular heartbeat, frequent digestive movements or diarrhea, weight loss, and sometimes markedly bulging eyes. Moreover, the presentation of hypothyroidism involves fatigue, depression, muscle and joint pain, dry skin and hair, difficulty concentrating, cold intolerance, decreased heart rate, constipation, and weight gain. Because they have no specific symptoms, thyroid problems could be attributed to other conditions, go unnoticed, or even be thought of as character flaws. Therefore, it is important to talk to your doctor about it, especially if a family member suffers from thyroid disease. Blood tests that measure hormone levels will help with diagnosis. Generally speaking, a person who produces too little hormone, will receive hormone supplements, while one that produces too much, will be given medications to reduce hormone production. Running a self-examination of the neck is an important first step to recognizing any unusual lumps or an enlarged thyroid that may point to thyroid disease. It’s easy to do (watch video). You just need to find a hand mirror and a glass of water. 1. Hold the mirror in your hand, focusing on the lower front area of your neck, above the collarbones, and below the voice box (larynx). Your thyroid gland is located in this area of your neck. 2. While focusing on this area in the mirror, tip your head back. 4. As you swallow, look at your neck. Check for any bulges or protrusions in this area when you swallow. Reminder: Don’t confuse the Adam’s apple with the thyroid gland. The thyroid gland is located further down on your neck, closer to the collarbone. You may want to repeat this process several times. If you see any bulges or protrusions in this area, see your physician. You may have an enlarged thyroid gland or a nodule that should be checked to determine whether further evaluation is needed. According to the website of the AACE, you should consult your doctor if: you have a family history, have taken Lithium or Amiodarone, or have received radiation therapy to the head or neck. In addition, monitoring the levels of TSH is essential for pregnant women because thyroid hormones play an important role in the child’s development. Moreover, because thyroid cancer usually has no symptoms, you should consult your doctor if you notice any lump, protrusion, or an enlarged mass in your neck. If you’re feeling down, or generally unwell, and can’t pinpoint why, it's time to ask yourself how your thyroid feels. If she’s not working right, you won’t either. Talk to your doctor soon and spread the word. The American Association of Clinical Endocrinologists and the American College of Endocrinology presented the blue paisley ribbon in 2012 as a symbol to unify the efforts of awareness of the thyroid. Paisley was chosen for its resemblance to a cross-section of the thyroid follicles, small spheres that make up the thyroid gland. Written by: Nicole Yordán, Student at the School of Medicine of the Medical Sciences Campus, University of Puerto Rico. Garber, J. R., & White, S. S. (2005). The Harvard Medical School Guide to Overcoming Thyroid Problems. (McGraw-Hill Contemporary, Ed. ).